This great Contextual Image (or "CTX Frame", for short) of the Dwarf Planet 1-Ceres, taken by the NASA - Dawn Spacecraft on January, 25th, 2016, shows us an Unnamed Cerean Impact Crater that is surrounded by a smooth Blanket of Ejecta, including (the usual, for 1-Ceres) bright - and still unknown, in origin - Material which clearly (as you can see) covers the East-facing Rim and some of the surroundings of the Crater itself. Both the area around the aforementioned Unnamed Cerean Impact Crater and its Floor are also peppered with huge Boulders (but, as a matter of fact, NOT very well visible - in our humble opinion, as IPF - in this specific picture). 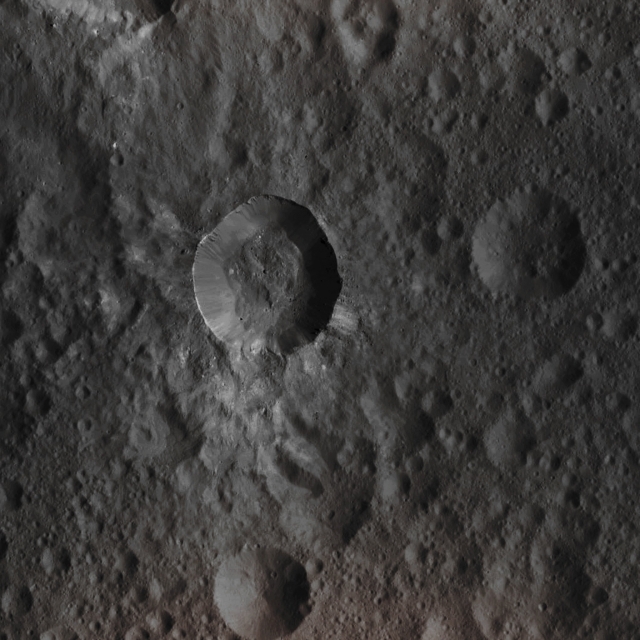 An unusually-looking (and almost triangular in shape) Dark Surface Feature can be seen at about 7 o'clock of the Crater's Floor; we, as IPF, do not know what it is (or what that could be) but it is really possible that what we are looking at right now is nothing more than an (however unusual) Image Artifact. This image (which is an Original NASA - Dawn Spacecraft's b/w and NON Map-Projected frame published on the NASA - Planetary Photojournal with the ID n. PIA 20397 - DAWN LAMO Image n. 43) has been additionally processed, extra-magnified to aid the visibility of the details, contrast enhanced and sharpened, Gamma corrected and then colorized (according to an educated guess carried out by Dr Paolo C. Fienga-LXTT-IPF) in Absolute Natural Colors (such as the colors that a normal human eye would actually perceive if someone were onboard the NASA - Dawn Spacecraft and then looked ahead, towards the Surface of 1-Ceres), by using an original technique created - and, in time, dramatically improved - by the Lunar Explorer Italia Team.